Understanding your needs is essential and if you’ve come here with a list of rooms in mind, don’t miss this opportunity to understand your needs on a much deeper level. Try the home design workshop before you start to design your own floor plan. If you have a particular style in mind it’s important to understand the features and limitations of that style in terms of the floor plan. Take a look at the home style section if you haven’t seen it yet. Looking round the room design section will also give you lots of food for thought. So with knowledge of floor plans, needs, home style and room design we can begin. Home space maps are concerned with the flow of the home and what spaces should be grouped together. Use the list of your needs from the home design workshop which will include obvious things like cooking, eating, sleeping, bathing, watching TV etc and some less obvious ones like ‘resting for 10 minutes when I come in from work’ or ‘having coffee on the deck and watching the sun rise’. 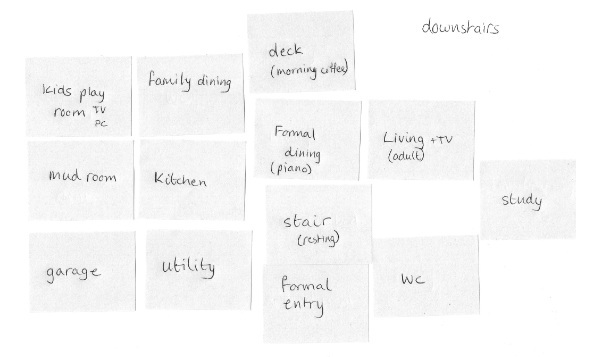 Now get yourself some small bits of paper (I use post it notes) and write down the major spaces like entry (maybe second entry as well), stairs, kitchen, dining (maybe have one for formal, one for informal), living (den as well? ), master (bed, bath, walk-in closet? ), bedrooms, study, garage. Include the spaces relevant for your needs. You can do this in graphical software of some sort rather than paper but it’s important that you can move the spaces around each other very freely. Next comes the fun part of moving the spaces around until you find arrangements you like. Start by thinking about any constraints for your design. If you’re remodeling some of the existing structure will be staying in place and perhaps some of the existing rooms are staying in place. At this stage you don't need a floor plan of the existing structure, just put the spaces that you know will stay the same in the appropriate place. If you’re designing more than one floor, bear in mind that staircases and chimneys run the whole height of the house. It's also more efficient to have rooms that need plumbing more or less on top of each other. A tip is to design the ground floor first, then the upstairs floors with the stairs and chimney if there is one as a constraint. Find where those special spaces will fit in. Think about where the smaller less obvious needs will fit in – note down on the stairs piece of paper that the area under it will be a resting place and add a piece of paper for deck at the back of the house. Take photos or save the the arrangements you like. At this stage you should have a few home space map designs like these ones. Once you’ve settled on an arrangement of spaces it's time to move on to the shapes and sizes of the spaces and where the windows and doors might be. It's a good idea to think about where the kitchen counters will be at this stage as well as a furniture layout. Time to get hold of some squared paper to help draw things roughly to scale and a pencil so you can erase things easily. Again - you can use a graphics or floor planning software package if you like. To make a start, think about the shape and rough dimensions you want each space to be. The room by room section has lots of information on dimensions to help with this and you can use the size of the rooms in your current home as a guide. Home building costs come in at $80 per square foot and upwards depending on how high-end the finish will be. If you add a 12' x 12' den that's over $10,000 at a minimum. Remodeling costs are slightly higher. I know about design but I'm not an expert on the costs of building. This budget example is used to illustrate how each square foot counts. Please don't use it to budget for your project. Start sketching out possible floor plans, guided by your home space maps and incorporating room shapes and dimensions. For the exterior boundaries be guided by the general shape of your home space map or of the home style you're thinking about to start with. Of course if you have an existing structure you'll need to measure the dimensions of the existing rooms and draw them on. Top tip - Draw your existing structure onto the squared paper then use tracing paper over the top so that you can copy the outline again quickly and easily. Don't forget to include furniture in the design. 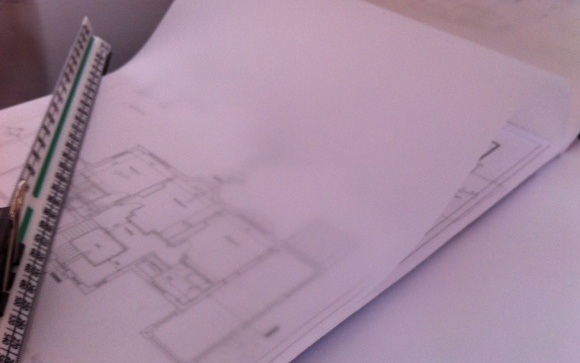 Another top tip - draw out some furniture items to scale on squared paper, and use tracing paper to do your sketching, then you can put the tracing paper over each piece of furniture and copy the outline where it needs to fit in the floor plan. 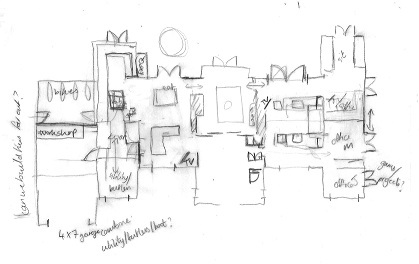 Design your own floor plan layout sketch - I did this on tracing paper looking through onto squared paper. 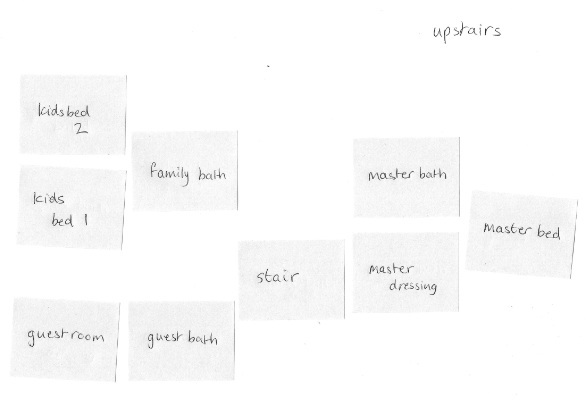 It ended up a bit different to the home space planning maps after a few iterations. Designing floor plans is a very iterative process. You'll try this and you'll try that and each thing you try teaches you something. Things don't have to be neat so feel free to scribble. Just keep trying things until you find an arrangement that works. The draw floor plans on paper like a pro page shows you how the professional play with floor plans on paper.